We’ve looked through the Tassomai data, and found some of the topics that our students find the hardest! We’ll post a brief explainer on each of these topics over the next few weeks in the run up to exam season. Give this series a read if you, your child or your students are struggling with any part of Tassomai - even if these particular topics aren’t problematic, we’ll also touch on some common errors students make when answering questions on Tassomai! Students often struggle with questions on rates of reaction and the effects of catalysts on them. This article will cover how catalysts work and what they do, but first it will focus on other ways to increase the rate of a reaction. There are four main ways to increase the rate of a reaction. Three of them do this by making the reactant particles collide more frequently, with more energy or both. Even though not every collision will necessarily cause the particles to react, if collisions are more frequent then successful collisions are more frequent too. If the particles collide with more energy, then each collision is more likely to be successful. Increase the pressure: There are more particles in a smaller volume, and so the particles collide more frequently. Increase the reactants’ surface area: There are more available particles, so they collide more frequently. Increase the temperature: The particles move around faster (as they have greater kinetic energy) - this means that they collide more frequently and with more energy. The fourth way to increase the rate of a reaction is with a catalyst, and that is what this article is going to focus on. What makes catalysts different is that they speed up the rate of reaction without changing the products of the reaction in any way - and after the reaction the catalyst is also unchanged. Instead, catalysts alter the reaction profile of a reaction. What is a Reaction Profile? Reaction profiles are diagrams which show the change in chemical energy during a reaction. In every reaction the reactants (the left hand side of the equation) and the products (the right hand side) have energy levels - the total bond energies on that side of the reaction. In an exothermic reaction the energy level of the products is lower than the energy level of the reactants, because it emits heat - the opposite is true for an endothermic reaction. 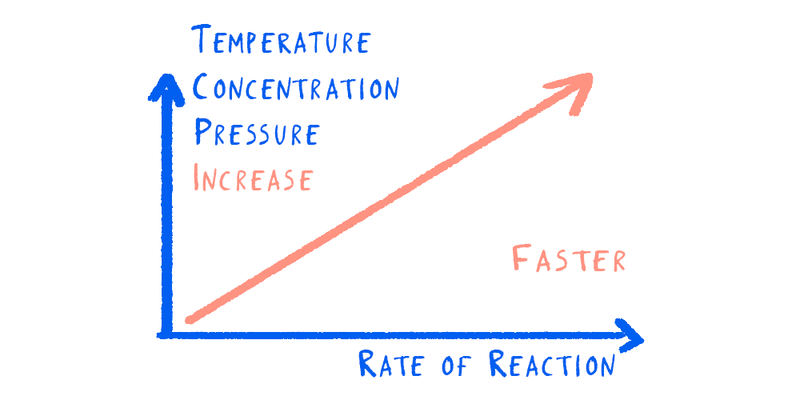 For a reaction to start, the energy level of the reactants needs to be raised to a certain point - this is the maximum energy level of the reaction. The difference between this and the energy level of the reactants is called the “activation energy” - the amount of energy which needs to be added to the reactants in order to kick off the reaction. Catalysts decrease the activation energy for a reaction by lowering the maximum energy level. This makes it easier for a reaction to start, and therefore makes the reaction happen faster - increasing the rate of reaction. However, even though the catalyst decreases the activation energy for a reaction, after the reaction is finished neither the catalyst nor the products of the reaction are altered - they are both exactly the same as they would have been if the catalyst had not been used in the reaction. The only thing that it changes is the rate of reaction - it does not chemically alter the reaction. A reaction needs to have the appropriate catalyst added to it, or it will not have any effect. Just because something works as a catalyst for one reaction, it does not mean it will work as a catalyst for another reaction. In addition to this, not every reaction has an appropriate catalyst - these reactions can only be sped up through increasing the pressure, temperature or reactants’ surface area. Enzymes are often referred to as biological catalysts. They are proteins which work in biological reactions as catalysts, speeding up the reaction. The other major difference between enzymes and catalysts is that when it gets too hot enzymes denature. This means that their active site (the part which works as the catalyst) changes shape, and stops working - so even if the reaction then cools down, the enzyme still won’t work, as it has permanently changed. Other catalysts do not denature, although they do have optimum temperatures. This is the temperature at which the catalyst is most effective - if it is hotter or colder than this, a normal catalyst will not work as well, but when the temperature returns to the optimum they will be as efficient as before. The first part of the question above asks if catalysts work by decreasing the activation energy or by increasing the rate of collisions. We now know that catalysts decrease the activation energy - unlike other ways to increase the rate of reaction, which do increase the rate of collisions. Therefore we know it is either A or B. The second half of the question asks if this decreases the distance between the reactants’ and products’ energy levels, or the reactants’ and maximum energy levels. By decreasing the activation energy, the maximum energy level decreases - so we therefore know that the answer is B.